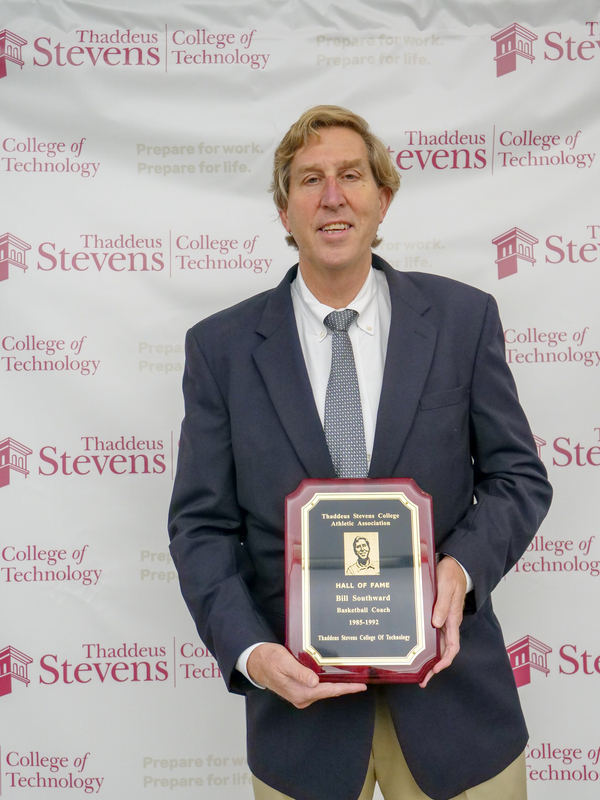 Lancaster, PA – Thaddeus Stevens College of Technology inducted 7 former Bulldogs into the Athletic Hall of Fame. 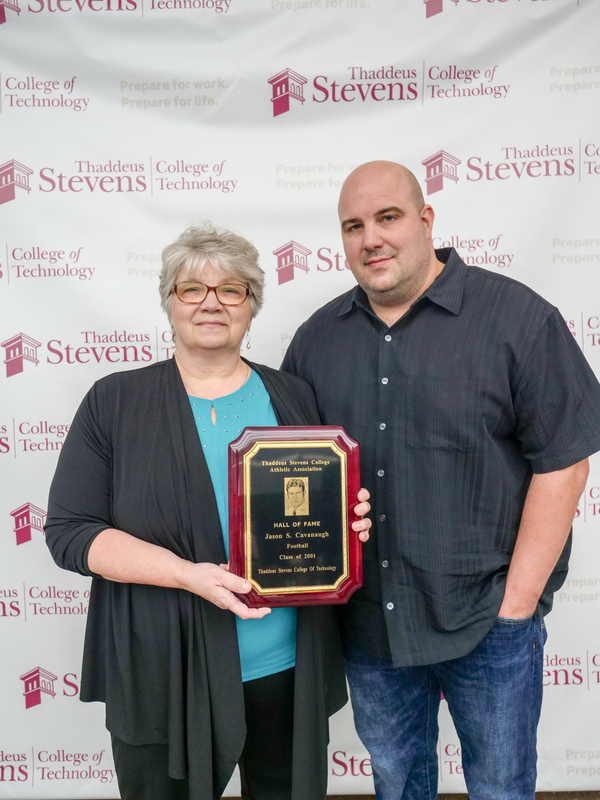 It was a night of nostalgia as Thaddeus Stevens College of Technology honors our new inductees into the Thaddeus Stevens Athletic Hall of Fame. 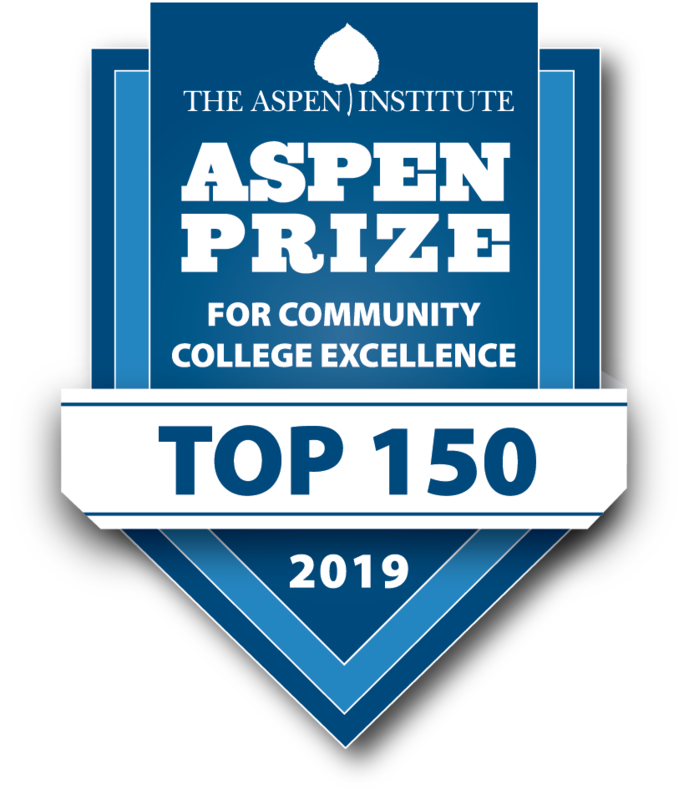 Those honored are: Jason S. Cavanaugh ‘01, Austin K. Cseh ‘13, Daulton Joseph Derr ‘11, Michael E. Liskey ‘90, Christopher Meyers ‘05, Willie R. Miles ‘92, and Bill Southward. 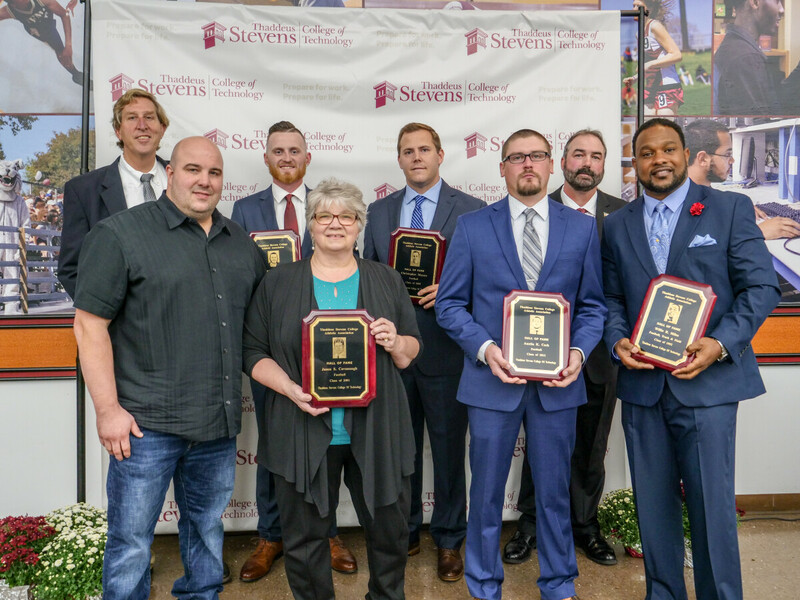 "Athletics have always been an integral part of Stevens, and they support the college's mission," said Thaddeus Stevens president William Griscom. 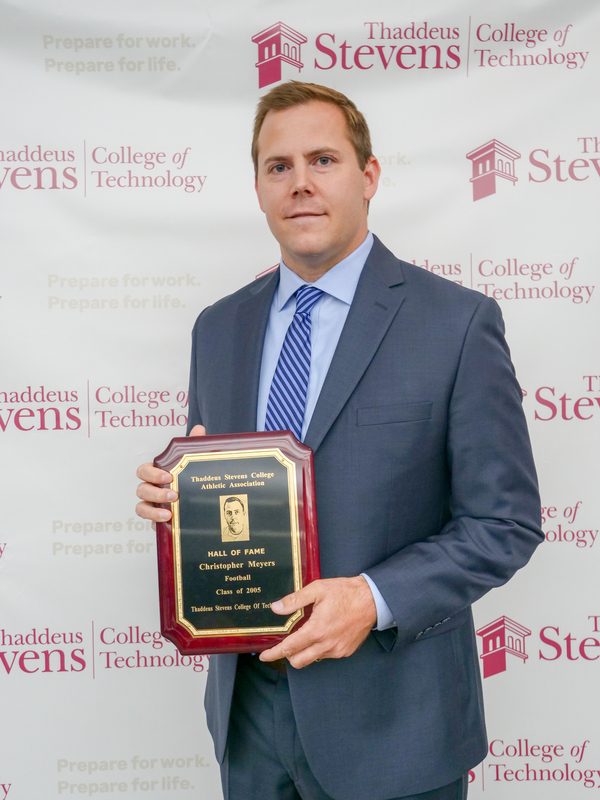 "For more than a century, Stevens has excelled on the court and in the field of athletic competition. This success is truly remarkable when viewed in context of the limited resources and facilities that were available for athletics." 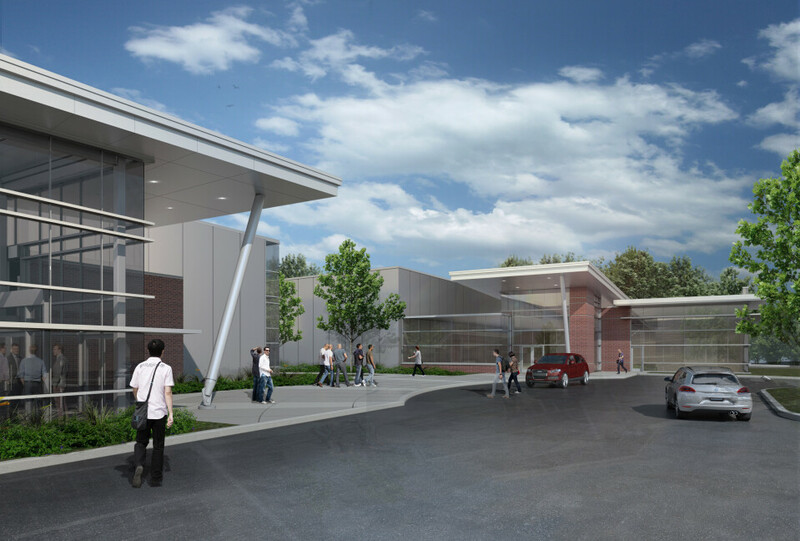 Jason S. Cavanaugh graduated in 2001 from the Architectural Technology Program. He was the starting quarterback for the Bulldogs for 2 years. Cavanaugh was also one of the team captains his senior year. Cavanaugh led the Bulldogs, who won the Seaboard Conference Championship, to an 8-2 overall record in 2000. These were the first back-to-back winning seasons in 31 years. In 1998 the football team ended the season with a 0-10 record. When Cavanaugh joined in 1999, the team went 6-4, a drastic improvement and the start of a turnaround for the College. In the Championship season (2000), Cavanaugh's sophomore year, he was named All-Conference. While at Stevens, Jason made all-conference quarterback both years. After graduating from Stevens, he was employed as an architect for S&A Homes, State College. Jason died tragically in 2002 as a result of an automobile accident. He was being inducted posthumously into the Athletic Hall of Fame. Austin Cseh graduated in 2013 from the Masonry Construction Program. During his time on the gridiron, the Bulldogs won the Seaboard Conference Championship both seasons he played for Stevens. Cseh was Seaboard Conference 1st Team Running Back/Slot Back for two seasons. In his sophomore year (2012), he was team captain, Thaddeus Stevens’ Most Valuable Player, and the Seaboard Conference League’s Most Valuable Player. That year he accumulated more than 500 yards receiving and over 1000 yards rushing, while scoring 15 touchdowns. In his freshman campaign, he rushed for over 700 yards and 400 yards receiving. That season he scored nine touchdowns. Cseh currently works for T.A. Silfies Masonry and coaches football and track & field at Palmerton Area High School. He and his wife, Bronwyn, live in Palmerton. Daulton J. Derr graduated with honors in 2011 from the Graphics Communications and Printing Technology program. While at Stevens, he played forward on the basketball for two winning seasons. Daulton Derr was instrumental in helping take the Bulldog basketball team to the conference championship game two seasons in a row. He averaged 15 points and 5 rebounds per game. For his leadership and contributions to the team’s success, he was awarded the John C. Stauffer Award and Team MVP during his sophomore year. He was also named to the All-Tournament, All-Conference, and All-State teams. Derr currently lives in Columbia and is employed by Kegel Produce. 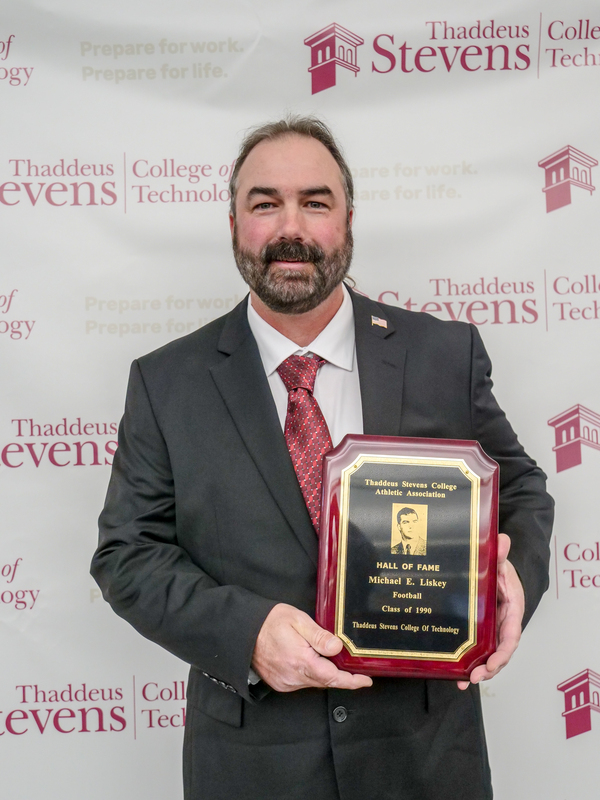 Michael E. Liskey graduated from Thaddeus Stevens in 1990 from the Metal Fabrication & Welding Technology Program. During his time at Stevens, Liskey played slot-back, tight end, and kicker. In his first season, Liskey led the team in receiving yards with 395, the most in the Conference. The team finished with a 4-5 record in 1988. During Michael’s final year, the Bulldogs completed their season with a 3-3 record in the Central Atlantic Conference and a 3-6 record overall. Liskey was named to the all-star team in his final season. While playing for the Bulldogs, Michael compiled over 1,000 yards offensively, scored numerous touchdowns, and would kick off for the Bulldogs often placing the ball within the 10-yardline. In 1995, Michael played tight end and kicker for the Central Penn Piranhas and helped lead the team to win the conference championship. Michael and his wife, Christine live in Elizabethtown. 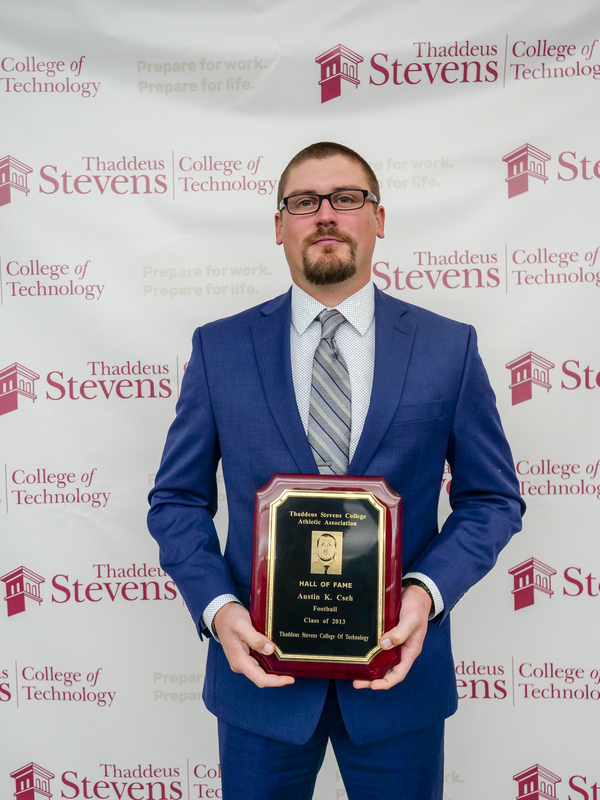 Christopher Meyers graduated from Thaddeus Stevens in 2005 with a degree in Mechanical Engineering Technology. In 2004 he played quarterback for the football team and was the first player in the history of the College to rush and pass for more than 1,000 yards in the same season. 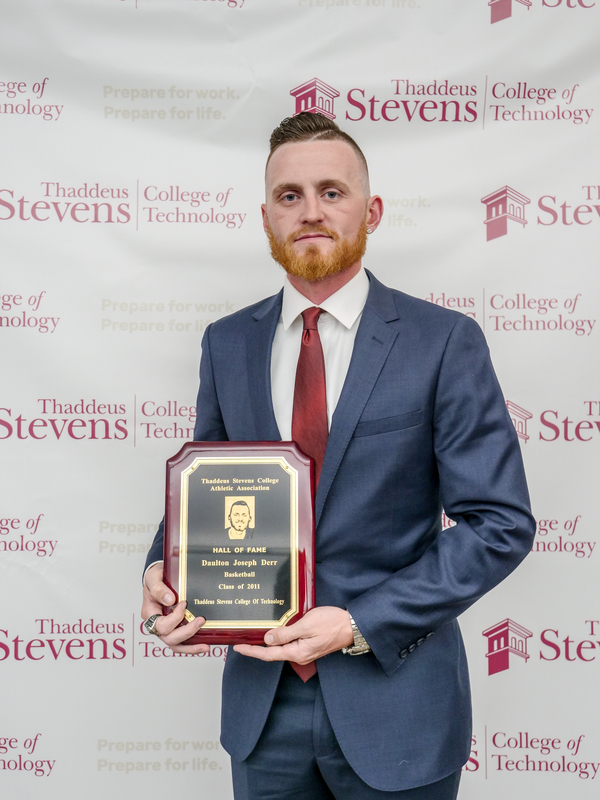 For his accomplishments on the football field at Thaddeus Stevens College, he earned the team’s Most Valuable Player award, the Seaboard Conference’s Most Valuable Player award, and was First Team All-Conference Quarterback. The team finished the season with a 10-2 record and a Seaboard Conference Championship! Chris currently works for PennAir as a Sales Engineer. He and his wife Meghan have a son, Brian, and they live in Lancaster. 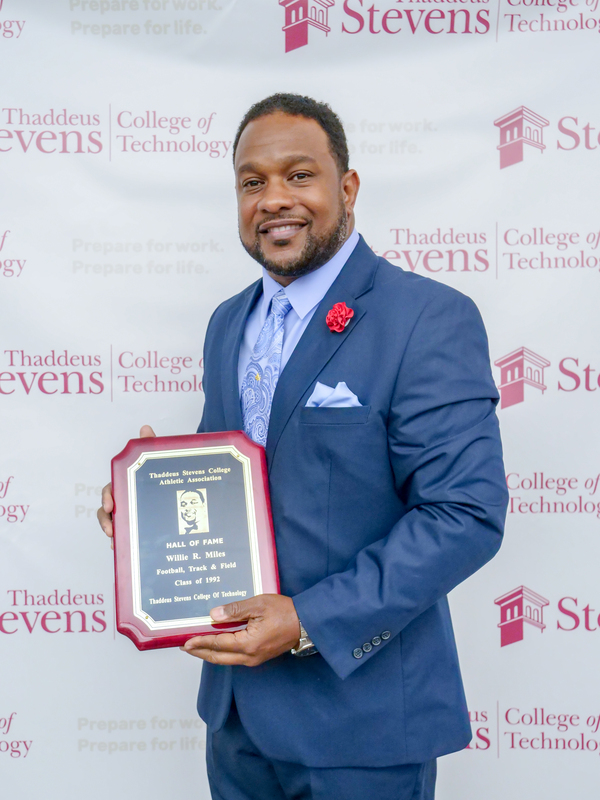 Willie R. Miles graduated from the Carpentry Technology program at Thaddeus Stevens in 1992. As a tailback on the football team in the 1990 and 1991 seasons. Miles also competed for two seasons on the Stevens Track and Field team. He held the record at the College in the triple jump with a 47’-3”. He was also a member of the record-holding 4x100 relay with a time of 0:42.40 and the 4x400 with a time of 3:22.00. After Stevens, he went on to complete his Bachelor’s degree at Mansfield University, where he earned Second Team All PSAC Return Man. He also ran the forty-yard sprint in 4.38 seconds a record at the time. Mr. Miles has been an instructor of Crisis Prevention and Intervention at the Devereux Institute of Clinical Training and Research and a Senior Program Manager at PA Children’s Behavioral Health Services for more than 20 years. He and his wife, Latasha, live in Coatesville and have six children and four grandchildren. Coach Bill Southward was the Bulldog’s head basketball coach from 1985-1992. In addition to coaching, he was the College’s Athletic Director from 1989-1992. During his tenure coaching Basketball at Thaddeus Stevens, the Bulldogs’ overall record was 91 wins – 49 losses. Coach Southward has also been successful as a high school basketball coach. He led the Lancaster Catholic High School basketball team to win the Pennsylvania State Championship and was Pennsylvania State High School Coach of the Year in 2003. He has worked for the Penn Manor School District for 36 years. He and his wife Sue have four children and six grandchildren. 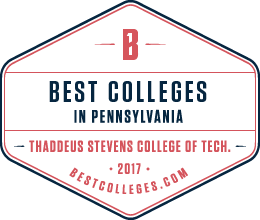 Thaddeus Stevens College of Technology is consistently ranked as Pennsylvania’s top technical college and awards associate degrees in 22 high-demand, skilled occupations. A full listing of programs is available at www.StevensCollege.edu.